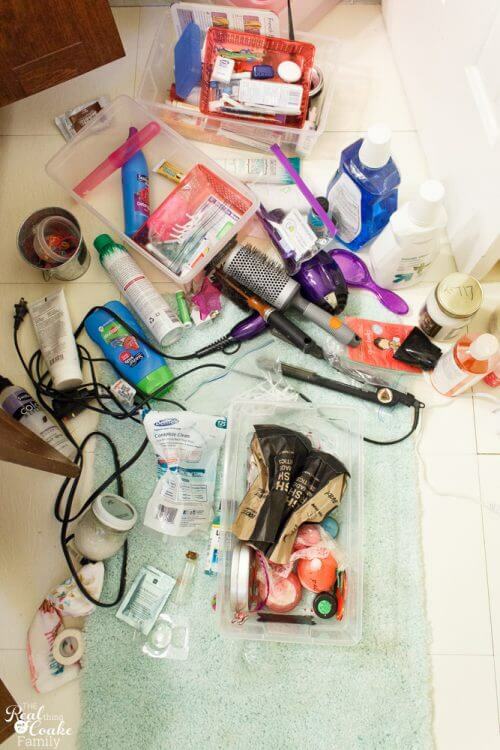 What is it with the bathroom that our children seem to make such ginormous messes? My kids are actually pretty good at being organized and cleaning up after themselves….well at least when I nag them, but the bathroom, it was like the lost city of Atlantis. It was a lost cause. I've organized it and reorganized it, but it always seems to come back to a messy state….and pretty quickly. Now that my girls are a teen and a tween, it seems to me they are old enough to help and keep things organized. 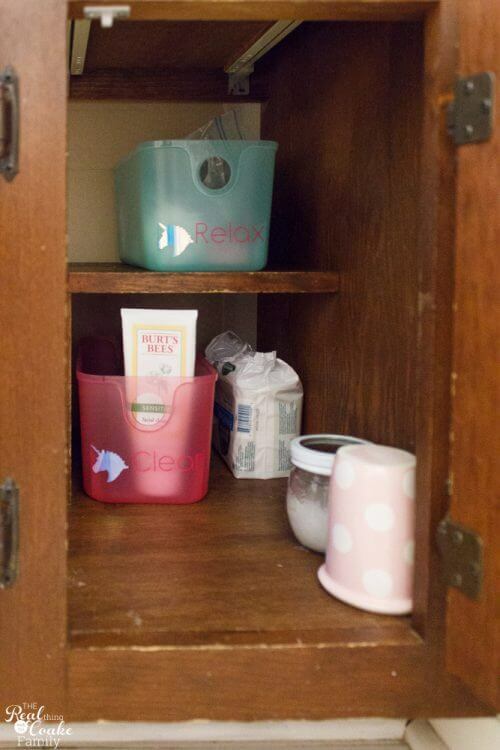 I decided to fight their bathroom messiness with some modern cuteness and see if that would work. So, first, here is the before. 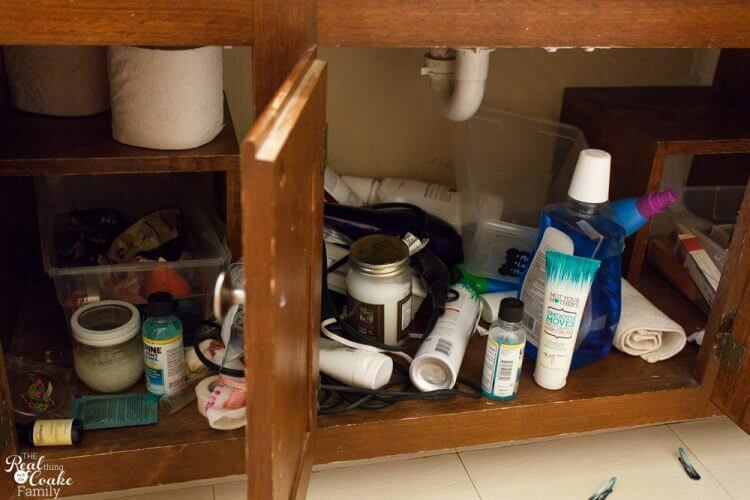 A hot mess of things just thrown in the cabinet. I'm guessing your bathroom looks very similar. In order to get things better, we have to make them worse first. 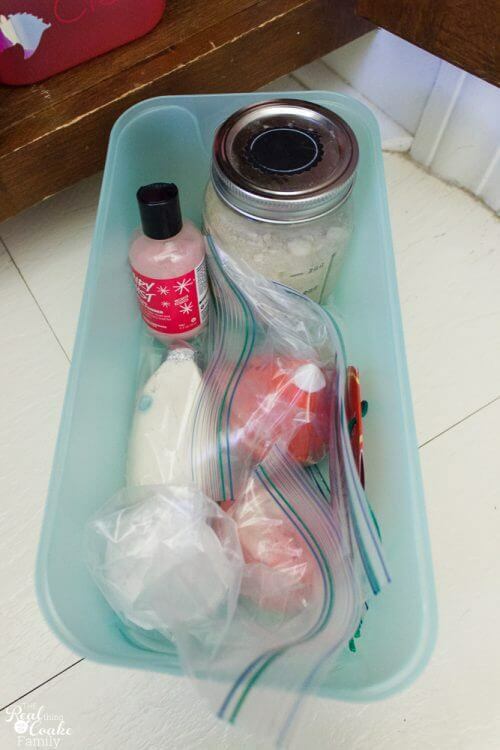 Pull everything out of the cabinets and drawers. Usually, this is the step that feels horrible and overwhelming because you see all that stuff and don't know what to keep and what to get rid of. In this bathroom, I thought it actually looked better when I pulled it all out. There really isn't usually an emotional attachment to much of anything in the bathroom, so deciding what to keep and what to go should be pretty straightforward. You will need to make sure to get rid of stuff that is empty, old or just doesn't get used. Don't hold onto things you are keeping, “Just in case.” You will be much happier with your end result if you just get rid of it and create additional open space. This was a pretty gross process for me. I don't know what all had dripped out of bottles, but it was stuck on the cabinets. Gross! I found these bins at the Target dollar spot this summer. They are fun colors and a perfect fit. 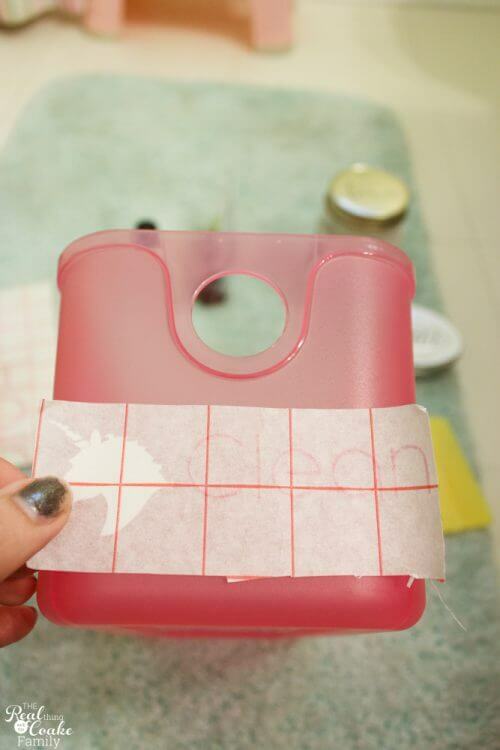 It will just make it so much easier for your kids (and you) to know where things go when cleaning up. 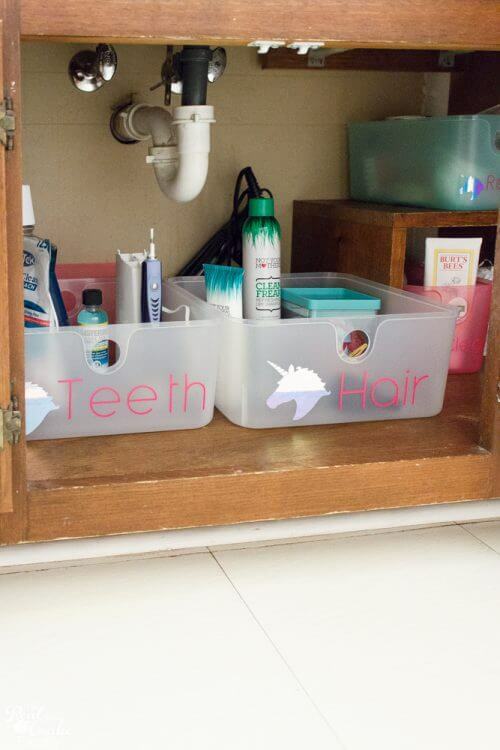 Grouping like things together will also allow you to see when you are running low on things as well as to create cuteness in the form of vinyl and unicorn labels! 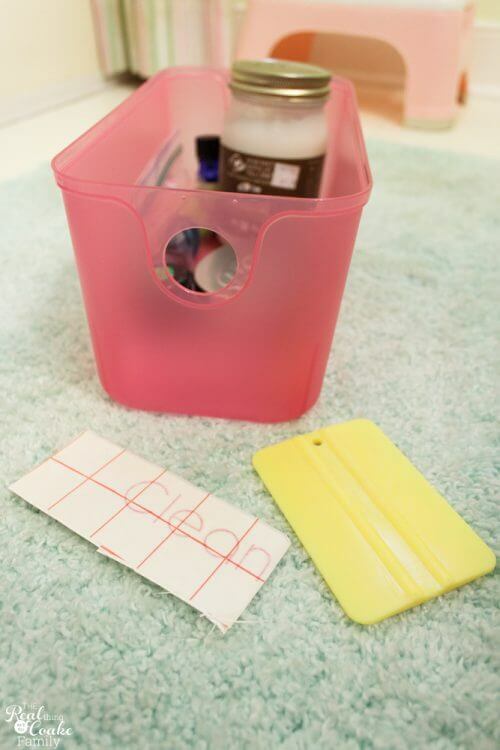 I had fun labeling my containers and I've got a Cricut cut file for you at the bottom of this post. 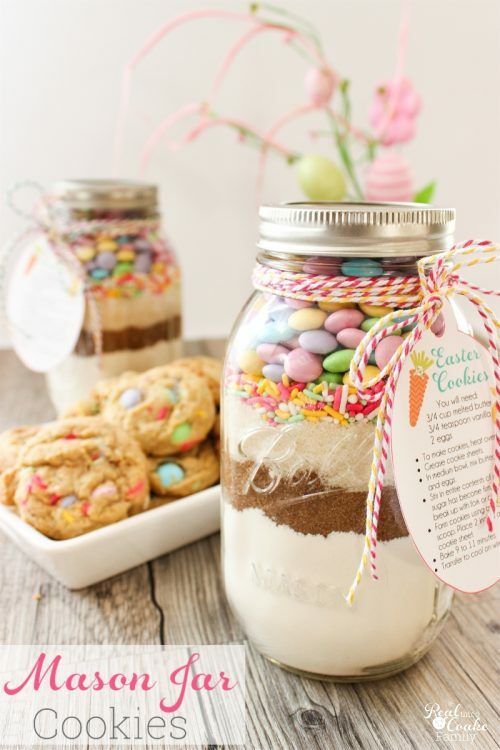 The way I figure it, if I can make the containers something the kids like to see, they will keep it neat and organized because they like the look and want to see the containers. 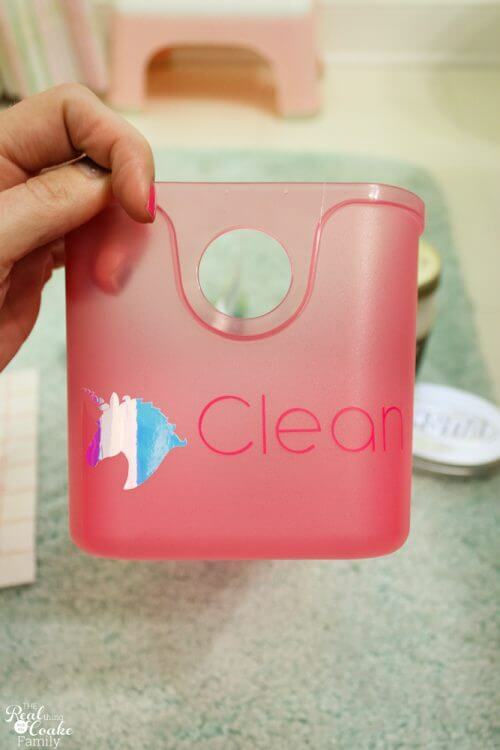 To label your containers like I did mine, you will need(following are affiliate links) two types of vinyl (one of which should be a holographic vinyl), transfer paper, a Cricut machine, and (optional) a credit card or squeegee to help press the vinyl flat. 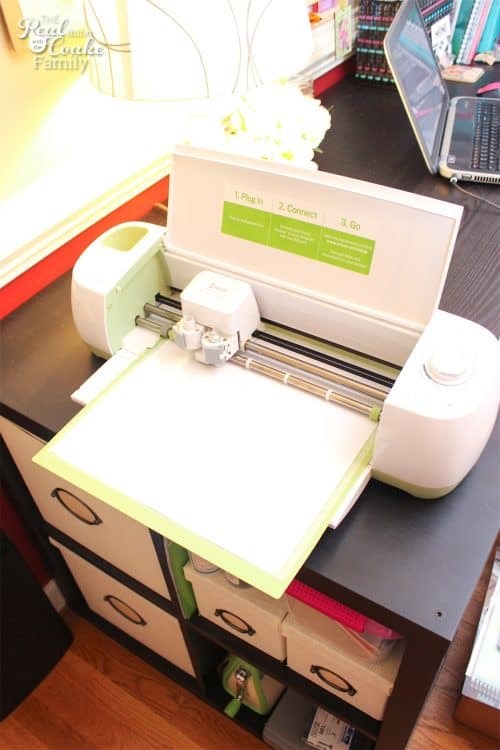 Cut your Vinyl and Use Transfer Paper to put the two types of Vinyl together. 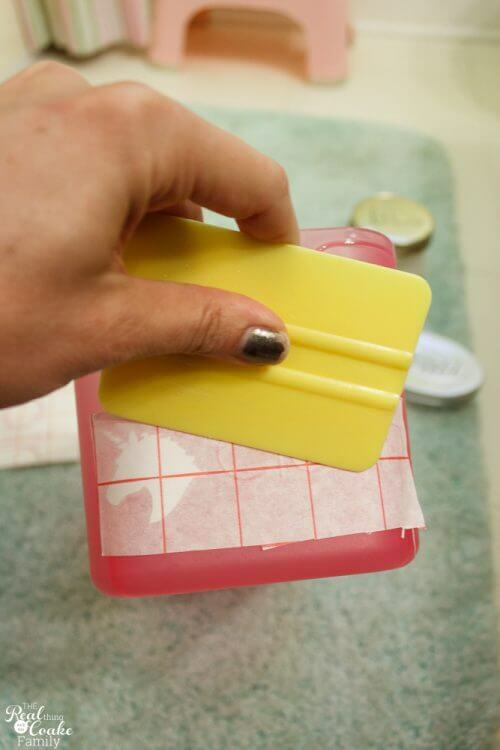 Press onto the container and use Squeegee to remove any bubbles and make smooth. 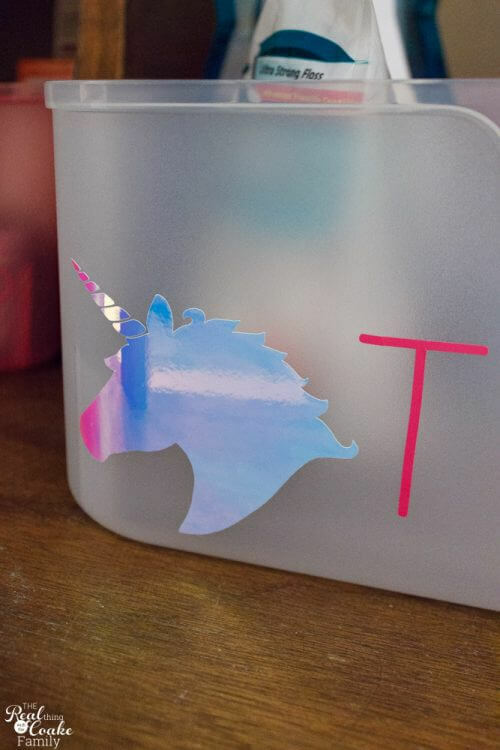 By using the holographic vinyl to cut out a unicorn, I added some modern cuteness for my kids! They love it. 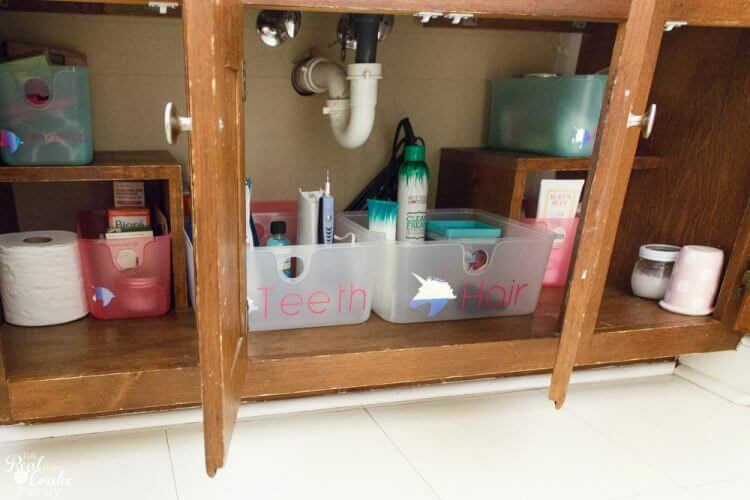 Let me show you how I organized their cabinet as it may give you some ideas for your kids' bathroom. 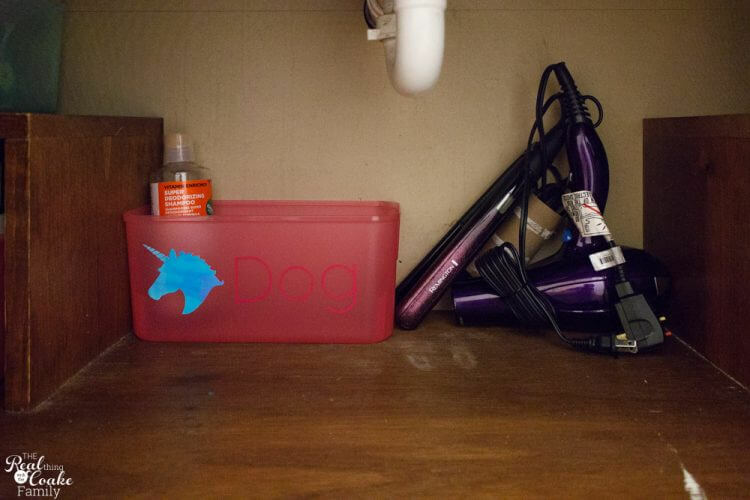 In the back of the cabinet is a container for the things we use when giving the dogs a bath. Their baths happen in this bathroom, so it makes sense for these things to be kept in here. My girls rarely use their hair dryer or flat iron, so those also go in the back because they don't need to be easy to reach. 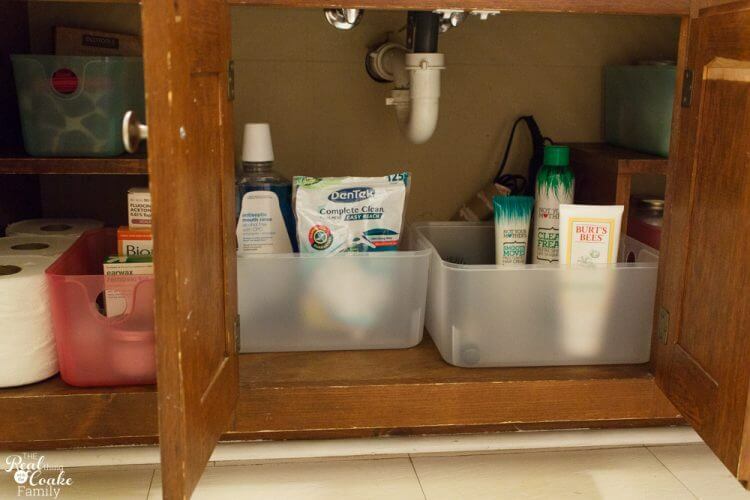 Organize things in your bathroom based on how frequently things get used. Our cabinets have these little half shelves just on the sides, so they are a great space to put some containers with things that get used but not every day. One tip: My youngest daughter loves bath bombs and Fun from Lush….it gets a little messy. I'm usually anti-plastic bags, but to me, after cleaning the cabinet, plastic bags for each bath bomb and/or Fun seemed like a good idea to not have that stuff stuck to the bottom of the cabinet again. 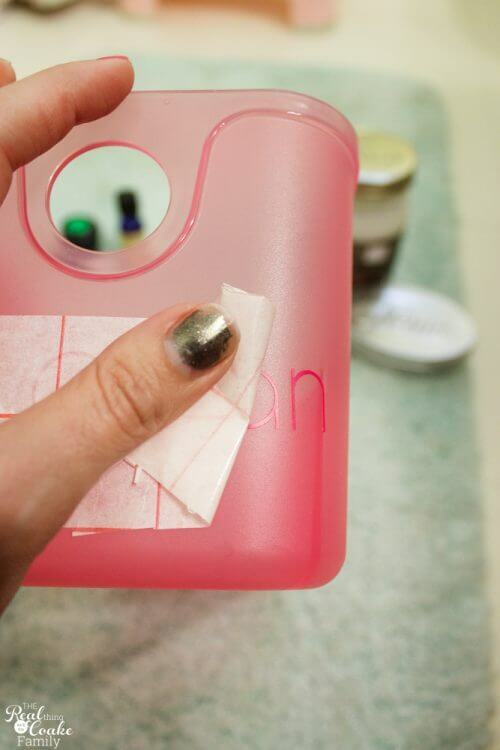 By grouping like things together, it makes it easy to label each container. 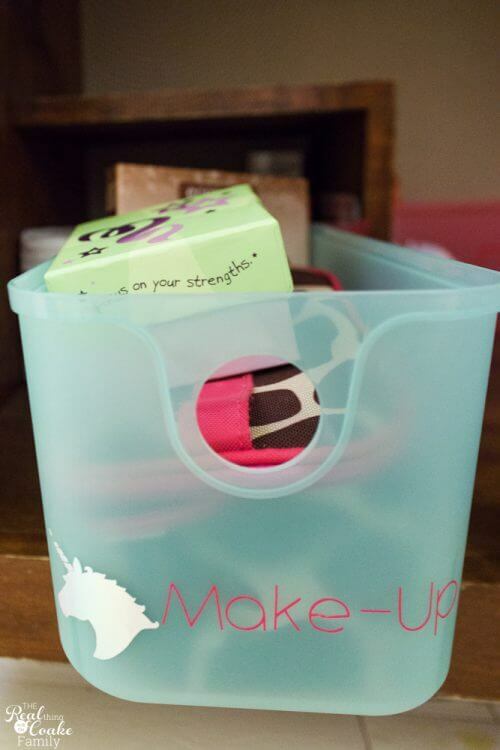 The most used items were put in the largest bins that are front and center. That will make it easy for them to both get things out and put them back in the proper place. 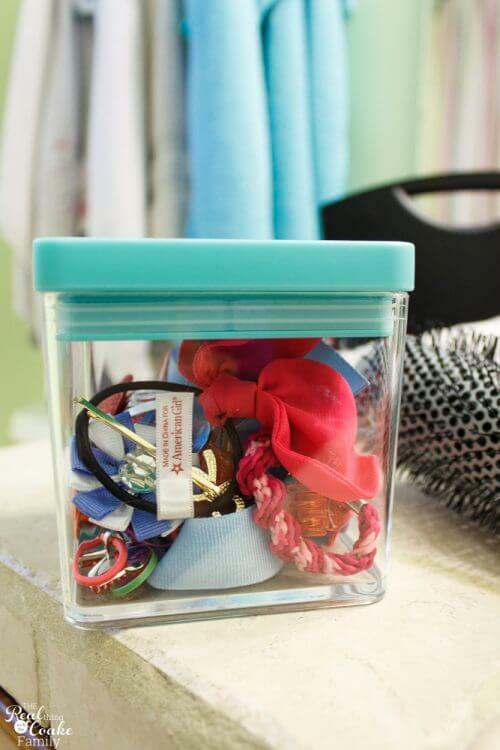 We used to have a little metal bucket on the counter with all of the hair ties, but it was pretty messy with water splatters and such and so on, so I found this little container in the kitchen area at Target and it holds everything nicely. 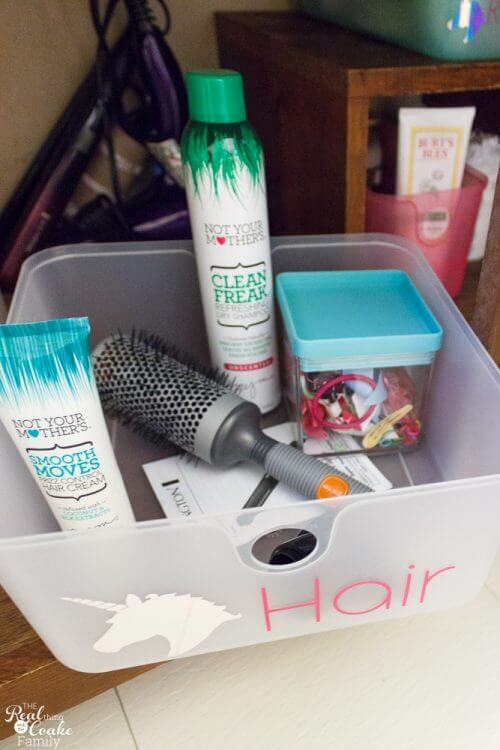 It also fits in the hair bin under the cabinet where it will stay nice and clean. The kids are keeping the space organized. 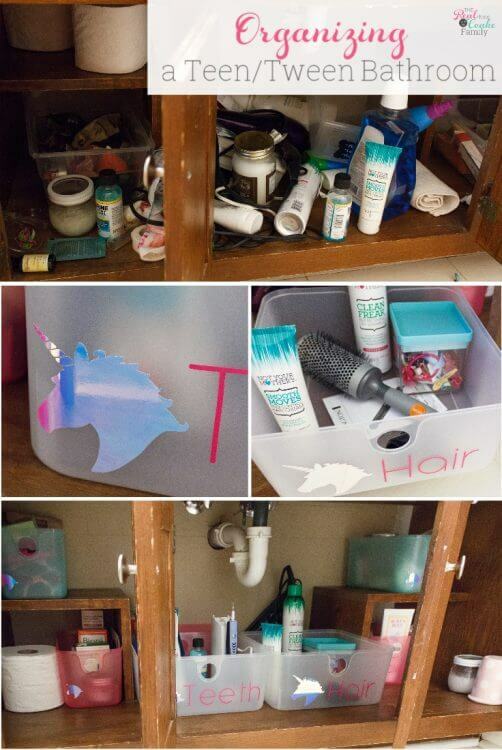 I thank the unicorns…and my hard work to get it organized as well. 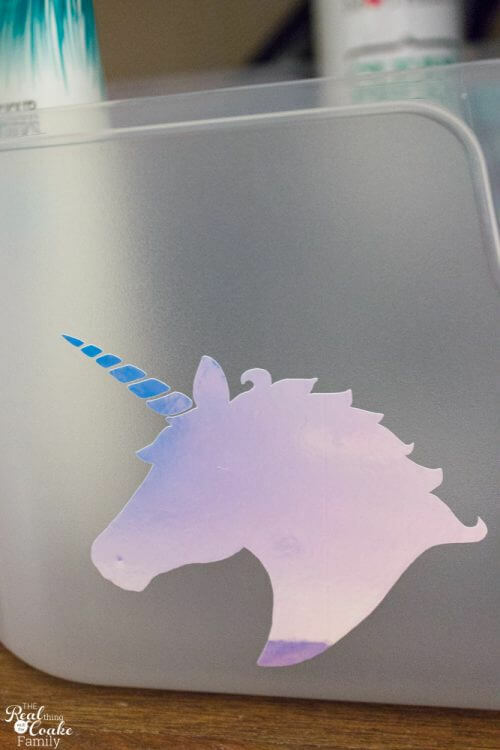 Not only do we all think the unicorns are adorable in the space they are made from holographic vinyl! So fun! On a hardness scale, this was a pretty easy organization project. It probably took me about 2 hours which included the time to purge, organize, label the bins and put it all back together again. Totally worth it! We did this project over the summer and the cabinets still look this organized, only now I've painted them and added new flooring. Oh, la la! 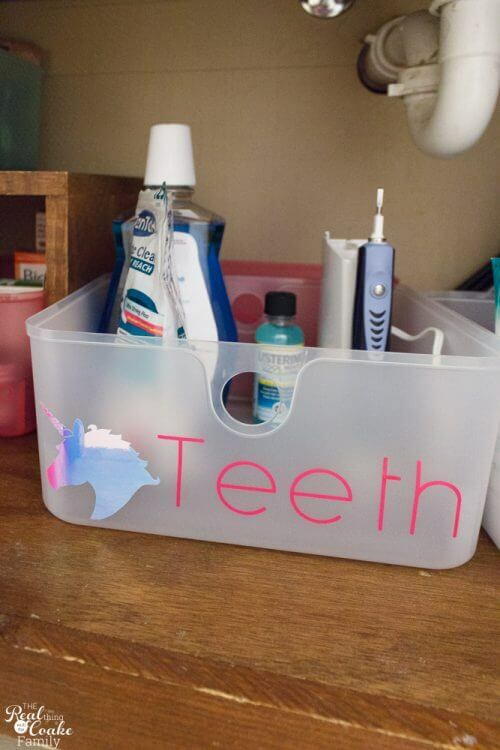 Just sign in below to snag your Cricut cut file and get started with some cute unicorn organization at your home! 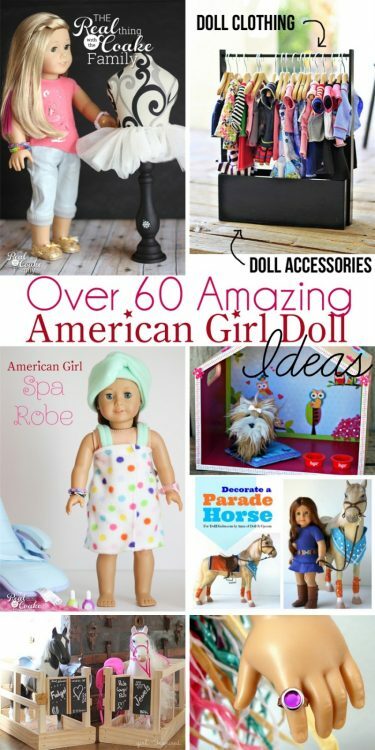 Question… Do your girls keep anything on the counter? Or do you have them put everything away underneath? They do keep some things out on the counter. In theory it isn’t very much, however, it seems to accumulate. We have set days in our house that things have to be cleaned up. So, that means at least a couple of days a week it looks nice and gets cleaned up.